With the most important event in the exhibition calendar for Quality Control and Metrology equipment and services suppliers fast approaching we continue with the 3rd in a series of preview articles highlighting a few of the many new and innovative solutions that will be showcased at the Control Exhibition May 7 – 10th in Stuttgart, Germany. 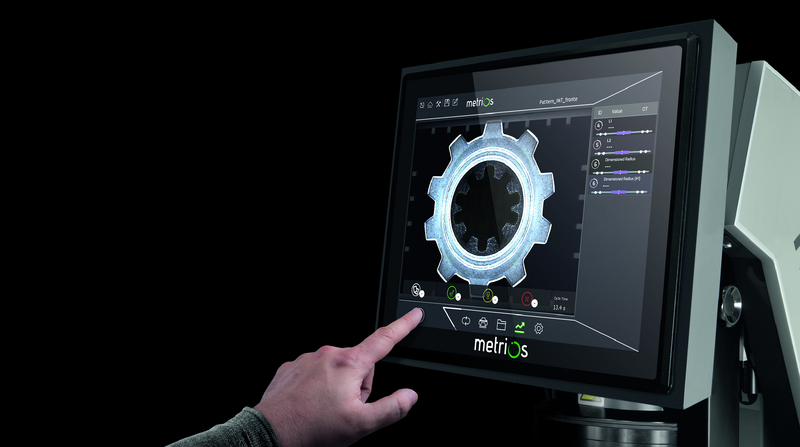 Metrios will showcase a different type of measuring system at Control 2019 comprising the evolution of the profile projector. The state of the art Cross Series and S Series feature a new XY moving stage; high-resolution images allow the user to capture the smallest details on micro-components and a wide variety of measuring fields adapt to a users varying part inspection tasks. Load capacity is up to 3Kg with a working area up to 280 mm in X and 200 mm in Y stage movement. The machines operate with an in-house developed software, providing automatic and objective measurements in a matter of seconds. Metrios’ versatility provides the possibility to measure parts that range across different industries including aerospace, medical, watchmaking, electronics, automotive, plastic and rubber manufacturing. FRT will presents the MicroProf 200 stand-alone metrology platform. This third generation system offers an ultra-stable surface metrology platform offering a multi-sensor concept, combined with hybrid measurement technology. The MicroProf enables a wide range of measurement tasks to be performed quickly, efficiently and intuitively and is an established standard 3D surface metrology measuring instrument in the semiconductor, medical and automotive industries. MicroProf 200 is very versatile allowing users to measure the topography, total thickness and sample layer thickness without contact. Various optical measuring methods have been combined to form one universal tool providing high-resolution detailed measurements down to the sub-nanometer range. In the context of the digital transformation of industrial production it has to be guaranteed that the physical world and its digital counterpart are in the same state. Mobile augmented reality (AR) systems offer high potential for advanced inspection tasks as reality is superimposed digitally. Deviations between actual components and their CAD specifications are visible at a glance. The VisionLib system from Visometry combines 3D data with image processing for quality control solutions: using model-based tracking technologies, CAD data is registered in real time to objects captured in camera images. The outstanding feature is a reliable object recognition even in low-light and dynamic environments: “Here most industrial AR applications fail. With VisionLib, customers can rely on robust recognition, so to use AR for inspection and measurements as well.“, explains CEO Dr. Wuest. Visometry also develops stationary inspection systems for complex in-line production processes, which can be quickly and flexibly adapted to different product configurations making it possible to check, measure and document not only the existence but also the orientation and position of components automatically during operation. API will present its updated series of RADIAN Laser Trackers offering the lightest, most compact and highest accuracy trackers available. The extended RADIAN laser tracker range comprises three models; Radian Pro, Radian Plus and Radian Core. The Radian Pro offers both absolute Distance Measurement (ADM) and inferometer (IFM) capability, available with 20, 50 and 80 meter range options and offers 6 degrees of freedom (6DoF). Radian Plus can be supplied with the API vProbe or iScan hand held probes. The vProbe is a light-weight, tactile probe, that extends the laser tracker coordinate measuring capabilities, by permitting intricate features and part characteristics outside the line-of-sight tracker set-up. The vProbe has more versatility than a portable arm CMM and is inherently suitable for large parts and styli lengths up to 500mm. API iScan is a hand-held, light-weight, non-contact scanner with new higher data-rate, point cloud capture speed, and a new global position sensor system. Radian Core is a spherically-mounted retroflector (SMR) tracker with measuring ranges of 50 and 80 meters. Vicivision will be displaying its latest innovations in optical measuring machines for quality control including the unveiling of thenew M1C model, with a measuring area of 160 x 60 mm, The M1C has been specifically designed for small turned parts and mechanical components, with the aim of providing high measuring standards in a price-competitive and compact model. Vicivision will also showcase the TECHNO Series featuring high-resolution images to capture the finest details, a wide variety of measuring fields to better adapt to the production needs, loading capacity up to 60kg and a working area up to 180 mm in diameter and 1250 mm in length. In addition a newly developed Touch Probe measuring system offering the combination of optical and tactile functions will be exhibited. This combined technology results in a complete measuring control system for turned parts in just one cycle, directly on the shop-floor. Inspection Manager is transforming the management of inspection requirements. One-click architecture automatically extracts dimensional inspection requirements (GD&T) from 2D drawings and 3D models, digitizes prints and generates automated ballooning creating inspection-ready reports, including FAI and PPAP. The new V4.6 adds the ability to work in metric or English units with one click. Integrated version control management allows storing unlimited design revisions of drawings with original and converted units. The working with dual set of units mode propagates through to ballooned PDF and final reports. A new SPC module allows users to monitor real time variations in manufacturing processes. Automatically capture inspection results from shop floor data; manual measurement results can be added in real-time using a tablet-based app that delivers results to a centralized database for consistent, accurate data capture. Inspection Manager’s one-click architecture automatically generates AS9102 standard reports and effectively manages inspection plans and results.